Identity Embrace: To Follow Jesus Means...? Following Jesus means going overseas to work as a missionary...right? Believe it or not, this very thought has entered my mind time and time again. When considering what it means to follow Jesus, I automatically think BIG. What can I say? I'm an achiever at heart...and for me going overseas as a missionary would be BIG. ...but truly, when I find myself thinking this way, the only response is, "Well then, I guess I'm not following Jesus right now..." Add some guilt. But that is not at all true. What does it mean to truly follow Jesus? To take up our cross, laying our burdens and sins at His feet, and pursue Him with abandon? What would that look like in your life, today? I was compelled to blog about following Jesus today because my time spent with Him was a wake-up call. I was recently discussing with a friend how, when we hear a still, small voice speaking a truth that definitely is not coming from our own heads, we just know it's God speaking. That was this morning. Me: "I just want to follow You so badly, Lord. Show me what that means today. I struggle with knowing how to do it on my own." Him: "Let me ask you this: Do you know that following me doesn't mean you have to move overseas and become a missionary? Maybe you need to take a different perspective on what it means to follow." And then it hit me that to follow Jesus today--and just today, for now--means reframing my thinking. It means deciding that even the "little" things are just as important as being faithful to God's enormous, change-invoking call. It means choosing patience with my family members, being kind to that stranger on the road, and taking moments alone with Jesus when He whispers, "Come away with Me". Today, if we can be faithful in following Jesus in the little things, rest assured we will be more apt to follow Jesus in the bigger things. He desires us to practice and practice and practice daily by surrendering, by allowing Him to change our hearts amidst the seemingly tiniest of circumstances. 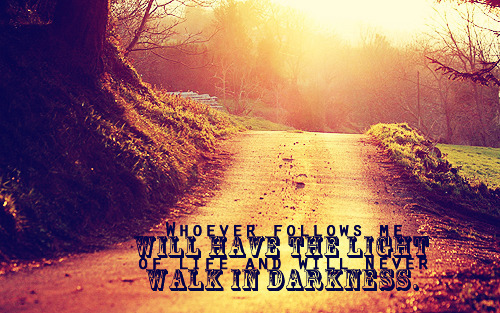 Our identities rest in Who we choose to follow today, so let's follow Jesus...even in the "little" ways. What does it mean to follow Jesus? In what ways do you choose to follow daily?